Currently browsing posts filed under "Eph Diary"
Shortly after I graduated from Williams, when I was studying at Albert-Ludwigs-Universität in Freiburg, Germany, I approached a professor lecturing on Wolfram von Eschenbach’s Parzival to ask her about a concept in that epic (I believed was) similar to one in Beowulf. “Approach” may not be the best way to describe how I sought to contact this scholar. It was more like chased down. I had to rush after her at the close of the class. Unlike her peers in the Purple Valley, she did not stay after to field questions from students, leaving almost immediately after she excused us. When I did track her down, she seemed almost stunned by my intellectual interest in the epic–and the comparison I was making (without her prompting) to another great medieval poem. One could say that is the difference not between Williams and the university in Freiburg, but between an American and a European university. And to be sure, I often enjoyed conversations with professors at the various graduate institutions where I have studied on this side of the Atlantic, even dropping by to visit a law school professor when I was in Charlottesville, Virginia this past weekend. Yet, we didn’t just have conversations with our professors at Williams. We often had spirited exchanges, touching on the subject matter of our courses, student life at a small college and even about our career goals or the news of the day. Given how much we complained how little dating there was at Williams when we were students, it’s fascinating how many of my classmates are married to each other. And of those couples that formed while we were in the Purple Valley, it seems the better part survived long after those happy golden years. As I drive now down the eastern seaboard, heading first south before turning north with the ultimate destination of Williamstown for my reunion, I have visited family members and friends, including two Williams couples. I am now in Charlotte, North Carolina. staying in the home of a good friend from the Class of 1987 and her husband, also of that year. They are now the second coupled classmates I have met on this journey, the others from 1984. Pardon the double negative, but I had never not known the elder couple as anything but a couple. What I didn’t know was that they waited until five years after Williams to marry. I had just always assumed that they would. As to the second couple (whose hospitality I now enjoy), well, I can still recall learning of their romance when she wrote me in Germany (where I was then living), telling me of this guy she met and had started dating. Now, these couples met at Williams, but going through my reunion book, I found quite a number of couples who got together only after graduation. Perhaps, some day, someone will study why it is that people who knew each other as Williams waited until after graduation to connect. But, for now, I will just note the high percentage of people who started dating at Williams and ended up married. From my experience at least, It seems almost that if the relationship survived Williams, it would survive into the real world. I write this post from a Comfort Inn in Richfield, Utah, having completed the first leg of my cross country drive (or x-country x-cursion as I have dubbed it) so I can attend both my niece’s Bat Mitzvah in New York and three weeks later my Williams Reunion in Billsville and in the between time, visiting friends and family on the east coast while taking time to pay homage to the subject of my dissertation at her North American shrine. And in the past few days, few weeks really, I have spent much of my time remembering Williams, with odd memories cropping up at strange moments. Because this is a big reunion (25th), the college sent out a facsimile of our original Facebook, only replacing our dorm and high school information with our current address and professional situation. So, I page through it, particularly at moments when I needed a break from dissertation writing (or was procrastinating that writing) and remember classmates and wonder at their current situation. I never would have thunk he or she would end up in the UK. Or that he would teach high school. Or she go into finance. Two things to note, some of the sharpest memories I have are of freshman year (and I do hope that that is not the same for my classmates about me). And then, there’s something a classmate said to me when after learning (via Facebook that he was in LA for a few months) we got together for lunch. As we talked about reunion and our class; he remarked how despite the size of the school, people had so many different experiences there. So many people loved the place–and for so many different reasons. It is amazing the diversity at such a small college. Mimi and I are hosting a dinner….. Such began the letter I received last year in my Paresky mailbox. Unlike almost every other communication at Williams, this one did not come via e-mail, though the RSVP instructions were electronic. Morty was inviting me to his formidable home on Route 2 for dinner, and I had little idea what to expect. It wasn’t like I had never been to a dinner before. I had set the table many times at home with our best china for Christmas dinner – pulling out silverware that belonged to a great-great something and the plates that usually lurked in the dining room cabinet. When I went to Washington D.C. for the finals in a scholarship competition, the Mayflower Hotel served so many nice meals that I got a little tired of them, and desserts so gorgeous that I almost wanted to leave them untouched. Yet, this invitation was different. President’s House dinners were something of a rumored secret on campus – at events with more major speakers, I sometimes saw a front section of reserved seats for the entourage of well attired students, faculty, and administrators coming from the Morty’s house. Jewish friends of mine spoke of celebrating Yom Kippur with Morty, and tour guiding friends had an invitation to brunch that slightly irked me – I had scheduled a meeting for the same time-slot. The invitation was also personal (he signed it) and purposeless: I was neither family nor competitor, but rather a guest. Come the appointed day and time, I proceeded up the hill and was promptly confused about where to go – the front door had a sign indicating another door on the side of the building, but no one else was around and I felt like a trespasser. I skulked around back and eventually found the right door, promptly meeting a greeter who directed me to drop off my coat and to pick up a nametag. Thumbing through them to find mine, I saw a mixture of names, most of which I was unfamiliar with, and proceeded with proper identification down the hall to a lovely reception. At this point, I should state that I used to have a problem with receptions. Whatever quality some people possess that allows them to slide in and out of conversations like butter is alien to me, and in feeling awkward, I made myself appear awkward. Yet, through a combination of friends and introductions, I somehow survived, and have since learned something about the art of social maneuvering. Having been informed of my table number by one of the many staff walking around with reception food, I went into a dining room with an incredible number of tables and chairs in close proximity and found my seat. My table had a family who knew Morty, as well as a professor and other students, and for the first time at Williams, I wasn’t in charge of my food. There was no salad bar or food line, and all I needed to concentrate on were the people at my table. In a larger sense, Williams is the same way for academics. Only in college are my true responsibilities limited to eating, sleeping, reading, and going to class. Williams takes care of all of the logistics for us, and while I might occasionally bemoan the political apathy that I think stems from such isolation from the trials of normal life, there is great value in being able to have a purely academic experience. In the same way, this dinner conversation was a purely social experience, and hugely valuable in that respect. Meeting someone new at Williams is always strange because either you or them inevitably have something to do within the next 24 hours that hasn’t been done, but I was free of any obligation but my conversation, and in that, was rewarded with a better experience than would have been possible otherwise. Dinner at Morty’s brought me back a little to that bygone era, and while I’m glad my sweat-stained t-shirt is appropriate attire at Driscoll or Greylock, dinner at Morty’s made my Williams experience a little more special, and made the snow trudging to come a little easier. I wish that everyone could have that sort of experience; plus, it’s neat to see everyone cleaned up. Because my fellow students and I were able to earn this Associate’s degree from Bard College, many of us saved money by entering college as sophomores and juniors. For others, the degree represented an opportunity to double major, or to skip intro and survey courses often required by many four-year courses. The most rewarding part of my experience at BHSEC, however, was more than just the Associate’s degree. The school introduced me to critical thinking and writing about my place in the world. Our teachers did not give us the recipe for performing well on state-wide tests and SATs, although we performed well in that respect, too. Rather, our small classes thrived on student energy in open seminar discussions and debates about course material. The challenge, as President Obama called for in his speech, never ended. No one could be successful in Bard by slumping in a seat. Not every student could learn this way. A few dropped out over the four years despite the supportive network of teachers and faculty available. However, those students did not cop out. BHSEC was emotionally demanding. Those students simply realized that their destiny was in their own hands, as Obama said, and that BHSEC’s accelerated method of learning, while it stimulates the mind, requires a sense of maturity some teenagers do not yet have while in high school. If we are going to strive for the educational equality Obama calls for, every American student should have the education I did. I was more than prepared for success in “real” college, largely owed to what I learned at BHSEC. As a rising sophomore at Williams College, I frequently refer back to my seminar experience at Bard. During my freshman year at Williams, I was not perfect, yet I knew how to approach reading a novel a week, how to write a formal 10-page paper, and how to ask for help when I needed it. I had professors from high school I could ask for advice. I was confident in my ability to survive a difficult class. In contrast, few of my new college friends had this advantage. Students at Williams have often said, “In high school, I didn’t even have to think. Now, it’s all about thinking. I don’t know if I even trust myself to come up with something good.” I wonder how much better they would feel about their schoolwork–and their selves–if their high schools had encouraged independent thinking and critical analysis as Bard did. BHSEC students come from the five boroughs of New York City, from both high and low income families. They are the children of immigrants from all over the world. They identify as Christians, Muslims, Jews and atheists. They are hipsters, athletes, artists, musicians, liberals, conservatives, and, most importantly, eager students. My experience at BHSEC taught me that our similarities outweigh our differences. A Muslim and a Christian can be best friends. A gay and a straight can both believe in finding true love. A Latino and an African American can joke with each other about the stereotypes that exist in their communities. My friend Naim taught me to live my Christian beliefs, no matter how hard they are to follow, as he fasted during Ramadan. My best group of girlfriends and I proudly called ourselves “the birds,” a play on the slang term “bird” for a minority girl who embodies the stereotypes of loudness and ignorance. We were from these same minority neighborhoods, yet attended one of the best schools in New York City. While the nation still struggles with issues of race– we hear about segregated proms in Mississippi and about African American children turned away from a private swimming pools in Philadelphia–BHSEC students considered our differences a means of learning from one another. During my senior year at high school, an Asian peer told me that I “smell Black.” Her comment opened up a discussion between the two of us and a school counselor about approaching one another. She apologized and said, “I didn’t even know you would take it that way.” We became friends. Without a non-confrontational discussion, neither of us would have understood our intentions. To me, President Obama’s support for BHSEC means he also supports these same approaches to racial issues among adolescents. Removed the roof and gutters of a four bedroom home. Painted that home’s deck and installed drywall. Installed a new roof and additional siding. Put in flooring and cabinetry of a three bedroom home. Installed baseboards, closet shelving, and window treatments. 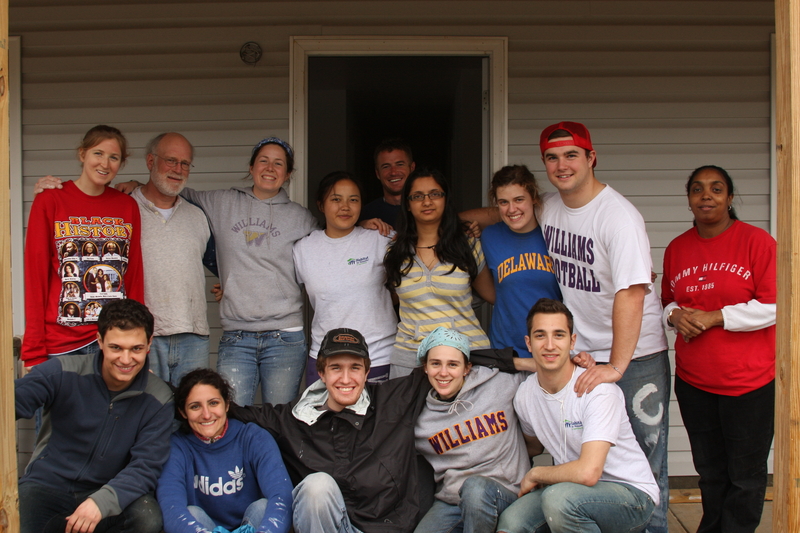 The homes we helped to build and equip will be sold for a downpayment of “sweat equity” given in labor to a habitat home, and a 0% interest mortgage, and we enjoyed working with power tools, other volunteers, and habitat employees. It was a lovely week; you can see more photos at junior George Carstocea 10’s photo site. Some samples: peeking over the new roof, and fun after work. EphBlog is powered by WordPress and delivered to you in 1.350 seconds using 48 queries..